A record of 21 years, 21 games, 21 wins. That’s not bad going for Ireland lock James Ryan, who nearly a season into his young career remains unbeaten and can now consider himself a European Champions Cup winner as well as a Six National Grand Slam hero. Ryan actually made his Ireland debut before his first competitive appearance for Leinster, having been selected by Joe Schmidt for last year’s tour of the United States and Japan and scoring a try minutes after coming on as a replacement against the Eagles. With 21 matches under his belt, Ryan is yet to taste anything other than victory, and with a man-of-the-match display helping to see off Racing 92 on Saturday his stock only continues to soar. The Blackrock-born lock still has some going to match Maro Itoje’s incredible 16-month run of 31 games unbeaten, but his impact in both the Leinster and Irish squads is plainly obvious as he continues to belie his age. If any evidence of that was needed, the reactions of his teammates inside the San Mames stadium more than conveyed that. “I first saw him at Clontarf [Rugby Club] and he was as string bean – skinny, tall, talented,” said prop Cian Healy, a veteran of 78 Ireland caps who has spent his career in front of some of the best lock forwards in the game. “It’s how people step up to the plate, but when you see him step up the plate it’s jaw-dropping, it’s ‘Hold on a second, he doesn’t look like he can do what he’s doing.’ It’s class. Eventually he’ll lose a game and we’ll pick him up and dust him off and send him out again. 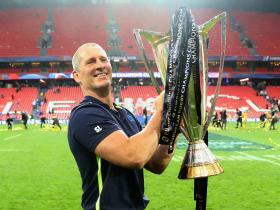 If the glowing reference from his teammates was not enough, his head coach, Leo Cullen, was also keen to single him out for praise in the immediate aftermath of Leinster’s fourth European Champions Cup final triumph. A key part of this emerging crop of young players is that they are grounded. One criticism of England is that they allowed themselves to grow complacent after the 18-game unbeaten streak, and have slipped from the seemingly untouchable perch as a result. Ryan is not the only player who has made a name for himself across the Irish Sea this season. Dan Leavy has excelled in the absence of Sean O’Brien and Josh van der Flier at openside flanker, while the injury-enforced retirement of Jamie Heaslip has allowed Jordi Murphy to make his name at No 8 ahead of his imminent move to Ulster. Garry Ringrose is now regarded as one of the leading players in Europe, while at Ulster Jacob Stockdale has been tearing up trees by all account. While Leinster were able to celebrate their triumph in Bilbao on Saturday night, it’ll be back to business this week ahead of the pro14 semi-final against rivals Munster. Ryan could potentially end the club season 23-0 if Leinster are able to reach the final and see off either Glasgow Warriors or Scarlets, and with a three-Test tour of Australia to look forward to in the summer, the Wallabies have been warned of what is heading their way.